← Design Culture Salon 3 – Design Activism: how does it change things? It was a dismal night to be out and about. An austere drizzle cloaked South Kensington, winter colds pervaded and many were those working through the haze of Benadryl or LemSip. On TV, el clasico, of Barcelona v. Real Madrid was playing. Another distraction. 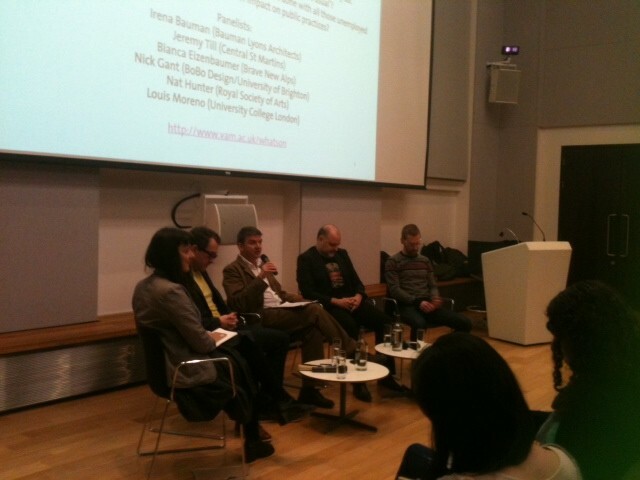 So it was encouraging that so many found their way out to the V&A to discuss design activism. For those who are concerned with these things, the news was additionally gloomy upon hearing of the 2012 Design Industry Voices report. This survey of 459 designers in the UK found that 59% of them would like to change job in the next year, half of them found a lack of leadership in their businesses and 87% saw that clients were expecting even more productivity for less remuneration. Mainstream commercial design isn’t necessarily a happy place. You can carry on and hope things get better. You can work for better conditions. Or you can seek alternative forms of creative practice. This Salon focused very much on the last of these while keeping an eye on the second. I think it was taken as read that things weren’t going to get better on their own. Design activism is a broad activity that touches on many other fields of practice, including social design, participatory design, community architecture, sustainable design, design for development, social innovation and, occasionally, service design thinking. Thus, defining it and its problems is a complex affair which brings in various perspectives and positions. These were represented by the panel speakers. Jody Boehnert opened the discussion by echoing this breadth of possibilities for design activism. At the same time she questioned its effectiveness if design activism’s quality of disruption was not maintained. Activism is easily appropriated and leveraged into mainstream systems of capital. It can be subsumed into all forms of ‘design for social good’. Meanwhile, activism engages activities that may even not be legal. There is a variety of available strategies in design activism, but, to repeat, it must be challenging, forthright and transparent in its politics. Jonathan Chapman looked more broadly to design activism as being a state of mind. Again, he saw the work of the design activist as being multifarious, citing a story of himself being involved in protesting outside parliament 15 years ago and then, five years later, being invited to present his thinking on emotionally durable design to a House of Lords committee. Design, he said, is ‘in between stories’. Being, as it is, about solutions and ideas, it moves the pages of a story and therefore has the power to nudge the narrative in one direction or another. Noel Douglas wants the role of the activist to be redundant because we achieve the change in the world we want to see. In particular, he believes that the possibilities of design combined with social media have a huge potential that organisations that could support design activists, such as Trade Unions, have failed, so far, to get to grips with. For Noel, design can be employed to make social movements more confident, ambitious and central to the transformation of everyday living. This is a challenge as the design profession itself is enormously fragmented. Studios are small. Freelancing prevails. Culturally, it is driven by individuation. The big task in design activism is to build a sense of collectivity, within itself and in society. Paul Micklethwaite emphatically declares himself not to be a designer. And yet, he is implicated into design processes in many ways. He spoke of working in social design which has a different client relationship to mainstream commercial design. There, work is invariably around restating or re-framing the design problematic. But his experience with, for example, the carpet producer Desso, shows that a quieter level intervention can be in rethinking the production-consumption too. That said, their motivations are business oriented. This is distinct from ‘capital [D&]A’ Design Activism that has a more radical edge. Design activism should really be preserved as a term for transformative, politically charged actions, he argued. In the wider Salon (that is, panel and all other attendees), we discussed scale. It was suggested that social design or service design specialists were looking to upscale processes and solutions. Conversely, there are already lots of innovations in public life that are already out there and accessible that can be down-scaled into local applications. Noel Douglas argued that there was a greater need than ever for mass education in design from school level upwards. This, I argue, would produce a more critical, demanding public of the design of their services, in turn also equipping people to be more knowing in their engagement in participatory design. At the same time, both Paul Micklethwaite and Jonathan Chapman saw the value in developing deep knowledge and skills through working with small groups of students. Few disagreed that there was a need for more holistic understanding in design, that design students equally needed to understand or have an acquaintance with political economy, psychology and a whole host of other related fields. Jody Boehnert stated that ecological though can not be imparted in a narrow way. After all, we are part of ecology and in this implication act in and on it in a variety of ways. A theme that has also run through other Salons, has been real public engagement in the production of things. The hacker community actively disrupts, distorts, recycles and re-scales digital technologies. People who don’t necessarily have a design training are entering into the formation of things and information in a practical sense, but also discursively by talking about it, sharing their opinions and motivations. Making stuff, as we had discussed in Salon 2, suggests forms of empowerment that open on to considering other futures. That said, I am personally wary of a wholehearted acceptance of 2.0 or 3.0’s transformative power. At what point does Open Source actually become a diversion rather than a political intention? How does it engage directly with sources of social injustice? How does it disrupt the dominance of financialist models of capitalism? Neoliberalism is a process, not a thing, it was pointed out. In that, it is working in many ways, in various contexts and for different people. Indeed, it delivers many of the tools that are used by activists (think Twitter and Facebook in the Arab Spring). As a process, neoliberalism is all about moving stuff, and money, and people, and aspirations, and economic structures, and political acquiescence and so on. So maybe design activism is an activator, as was also suggested. It acts on, through and in, but not for these processes. Perhaps Tony Fry’s notion of design as being ‘re-directive’ is worth considering here. This entry was posted in activism, recession, scarcity. Bookmark the permalink.